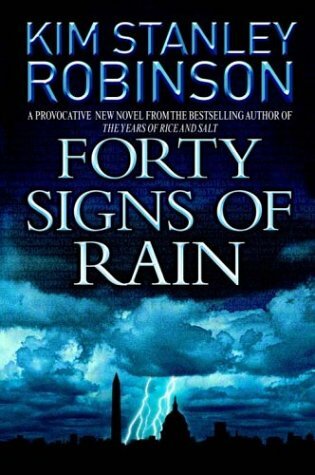 Forty Signs Of Rain is the first novel of the Science In The Capital trilogy, published in 2004. It introduces the main characters, scientists in the National Science Foundation in Washington, D.C. In Washington, DC, the National Science Foundation guides science on its usual procedures of peer-reviewed boards and budget allocations. Politics are little concerned of climate change. The arrival of the Khembali, a buddhist sect whose native island is in danger of being flooded, heralds some important changes. Like all three volumes in this trilogy, the novel is divided in ten parts. Each part begins with a short incipit (in italics), often unrelated to the main characters and told from a different or omniscient point of view. The part then contains short chapters, each focused on one of the main characters (Frank, Anna or Charlie) and narrated in the third person. Each chapter thus follows a storyline that develops simultaneously with the rest of the part’s chapters. It’s another day in the life of Washington, District Capital. Scientists, lobbyists and politics strive through the legal and institutional apparatus to advance their projects. Anna Quibler, scientist at the National Science Foundation’s (NSF) bioinformatics division, meets the Khembali, a displaced people of a drowned island of the Indian Ocean who just set up their embassy next to NSF’s headquarters. They hope to make the most powerful country in the world, partly responsible for the sea rise via carbon emissions and the resulting global warming, to take notice of the plight of the victims. Charlie Quibler, Anna’s husband, is a stay at home dad who takes care of their son Nick and their toddler Joe and, via phone and e-mail, works as an environmental policy advisor to Senator Phil Chase. Juggling his important job as Mr. Mom and trying to draft a bill in favor of a stronger climate policy is a tricky task. Charlie is disgusted at the un-scientific climate change skepticism of the President and his science advisor. Via Anna, Charlie meets the Khembalis and wires them with DC lobbyists to make their cause heard. Despite Senator Chase’s attempts at gathering support in Congress and the White House, Charlie’s draft climate bill for Chase is torn apart in Congress committees; hoping for more public attention to the matter, Chase decides to leak the bill to the press and effectively abandons it, which upsets Charlie. Frank Vanderwal is a bio-maths expert visiting NSF for one year from the University of California - San Diego and working under Anna. Frank lives alone in a temporary flat which became his permanent dwelling. He enjoys observing people around him and explaining their behavior through sociobiology, making evident the activities we feel most fulfilled at as primates; he ponders about the prisoner’s dilemma and altruism as a life strategy; he climbs at the Rock Creek Park. He takes interest in the work of a promising researcher, Yann Pierzinski, working in his ex-employer, biotechnologies start-up Twin Pines Generique (TPG). He moderates an NSF committee for funding research projects -- in which neutrality of the members is paramount and double-checked – and he attempts to shift the committee’s opinion in Yann’s favor, thinking that this will be beneficial for his future job back at TPG; however he’s out-witted by another NSF committee member who has vested interests in a bigger competing biotech firm, Small Delivery Systems. Leo Mulhouse is chief researcher in TPG, pressured by the company’s management to produce results that are conclusive, patentable and profitable. TPG’s future is at play as start-ups are bought and sold by prospecting venture capitalists. Leo leads his team, which includes Yann and Marta, Frank’s ex, through months of trial-and-error research in new delivery methods of gene-based cures in cells, for which Yann’s theoretical math finds practical applications. The team ends up developing solutions not for human illnesses, as originally intended, but for lichen-aided tree growth, through which carbon dioxide sequestration is accelerated. TPG ends up bought by Small Delivery Systems; Leo finds himself without a job and sees his house on the San Diego cliffs threatened by landslides brought about by land overexploitation. Frank writes a vehement letter about NSF’s ineffectiveness against environmental change to Diane Chang, head of NSF. He then attends a speech by Rudra Cakrin, a Khembali sage, on the relationship between science and Buddhism and how they both aim at similar things -- reducing suffering and increasing compassion -- though through different means -- technical versus humanistic -- and thus positing altruism as the best adaptive strategy for the survival of the human race: “an excess of reason is itself a form of madness.” Frank has an epiphany moment, and his excitement grows after sharing a passionate kiss with a mysterious girl he was following around in the metro. Frank breaks into Diane’s office to retrieve his letter but it is too late. Diane invites Frank in an NSF Board of Directors meeting and Frank fully participates in the debate: Frank suggests that NSF should commission work rather than accepting proposals and that the power of science in policy decisions should be increased. Diane assigns Frank to lead an NSF committee to tackle the climate change problem, to stay at NSF for another year. As Charlie begins suspecting that the Khembali’s interest in his son Joe might be related to their beliefs in reincarnation, a big storm hits Washington. Flooding ensues; the animals of the zoo are released. Frank helps in the relief effort and has a fleeting glimpse of his mysterious woman. Ferried by boat over the Mall, Charlie teases Senator Chase over doing something about global warming. Frank Vanderwal: Bio-mathematics expert, originally from UCSD, ending a one-year visit to NSF in Washington DC. Has an interest in sociobiology and the remnants of primate behavior underpinning modern behavior. Likes climbing and kayaking. Anna Quibler: Director of the Bioinformatics Division at NSF. A passionate and hard scientist, wary of anything that is not science. Wife of Charlie, mother of Nick and Joe. Charlie Quibler: Environmental policy advisor to Senator Phil Chase. Works from home and is Mr. Mom to toddler Joe. Leo Mulhouse: Chief researcher at Torrey Pines Generique, in San Diego, California. Lives in Leucadia. Reading (or rather, listening to) this book in February 2013, the hair on the back of my neck literally stood up when the name of the storm that hits Washington was spoken: Tropical Storm Sandy. I had to check the publication date of the book....very spooky experience.